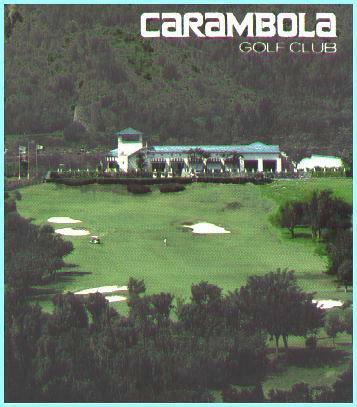 Carambola golf course is famous because it was featured on the 1960s TV show, "Shell's Wonderful World of Golf." Lush tropical forests surround this lovely course. I played at this course during a one-day visit to St. Croix from a Caribbean cruise (1994). 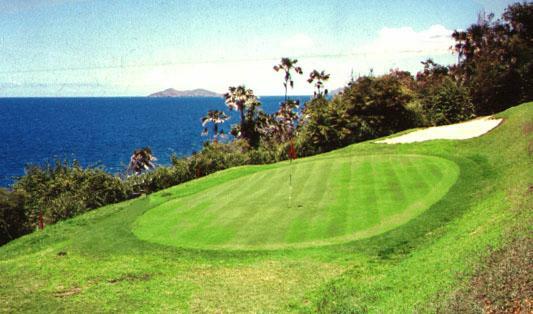 On another cruise to the Virgin Islands, I played at Mahogany Run nestled high in the hills of St. Thomas, somewhat close to beautiful Magen's Bay. In recent years, former President, Bill Clinton and Tiger Woods played at this course. 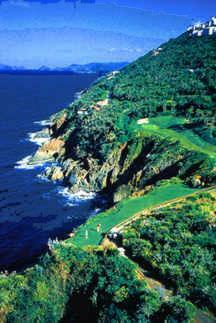 Couple of holes hug the coastline, including signature hole #14 shown to the right. Its a hole you hit over an ocean cove. The hills box in many of the holes at Mahogany Run. Errant shots to the right or left sometimes turn out OK, because they riccochet off the rocky walls and on to the green. Holes #13 and #14 present photo ops for the golfer-photographer. I enjoy playing with the locals. I met three friendly chaps from St. Thomas during the second time at Mahogany Run. I learned all about life in the Virgin Islands.